Week 5 of Marian Pena’s Row-A-Long is here! Be sure to check out what people have been making in the Flickr group, and the Facebook group is also great for more info and pictures. AND WE ARE GIVING AWAY AN EQ7! For the other prizes, please visit the designer’s blogs to enter! For the EQ7, see below! Visit Marian’s site for more details and to see the rules and guidelines on the other prizes. Enter to win an EQ7! Sorry our contest is over! Susan who commented “I get my inspiration from quilting magazines.” was randomly chosen as our winner! Congratulations to Susan and thanks to everyone who participated! I get my inspiration from nature! I get my inspiration mostly from online blogs. My inspiration from pictures of landscapes. I get inspiration from everywhere…..nature, the internet and friends! I get much inspiration from pinterest, quilt books and magazines. I am inspired by blogs and Instagram. My inspiration is from nature & blogs, & quilt books. My inspiration comes from so many things. A family member may mention something they saw or liked and off goes my imagination. Sometimes I may see or, as strange as it sounds, hear something that starts me thinking. These are my most frequent sources. I get inspiration everywhere…nature, stories, a glimpse of sunshine through clouds and, especially, from my fellow quilters and bloggers who never fail to inspire me! Trees, rocks, lakes, clouds — anything with color and texture inspires my quilts. Inspiration comes in all forms from all places, but especially for me in Nature. I actually like sewing baby quilts, so the fabric is a big inspiration. Then it would be other quilters. Thanks for being part of this and the fantastic giveaway. I am inspired by what I see in nature, on the internet and by my children! I get quilting inspiration from quilts at people’s houses, from books and magazines, and from blog posts. I’m inspired by others creations and from blog posts. I try to be constantly vigilant….inspiration is in the eye of the beholder. My inspiration comes from magazines, blogs, books, and fabric. Inspired from other quilters, thoughts, magazines, I would say from everywhere and anywhere. Inspiration is everywhere, a tiled floor, nature, just keep you eyes open. Inspiration from everywhere. Other quilters and their projects. Thanks. For me, inspiration comes from the internet. Pinterest, blogs and tutorials. Colour draws me in, and I especially love pictorial imagery. Paper piecing is a big draw for me. 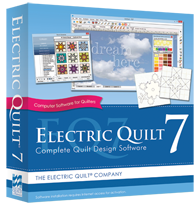 I would love to be able to turn pictures into paper piecing patterns and EQ7 would be a dream come true! Most if my inspiration comes from others. I find a quilt I like, change it around and go for it! Anywhere. Nature. Architecture. From inlaid tiles to antique cobblestones. I am inspired by pattern designers and other quilters! If I see something they did and love it, that inspires me to make my own. I get my inspiration from everywhere, nature, photos, internet, you name it…there is always one more quilt that I NEED to make! I would love to have this program….the possibilities are endless! Thanks! I get my inspiration from everywhere. Nature is a good old source too. I’m always looking for inspiration…but mostly it strikes out of the blue when I am just daydreaming. I get inspiration from so many sources. I love watching what other quilters are making. The blogs, books and quilt shows are great resources. Sometimes the geometric shapes or color in tiles, buildings, signs, logos inspire a design. i get it from all the great blogs that I follow can’t be beat seeing what all these woman come up with. I get inspiration from nature, my kids, blogs and magazines among others. I get my inspiration from quilting books, magazines, and especially blogs. Thanks! I get inspiration from quilting books, blogs, quild show and tell, Pinterest, and even from architecture and nature. Most of my inspiration comes from the internet (Sewhooked, Fandoninstitches, Pinterest), books, and patterns. My inspirations for quilting comes from various sources, books, internet, pictures, my imagination, nature to name a few. I get my inspiration from the blogs that I read, from nature, from books and magazines, and from architecture. I love to look at pictures on sites such as Pinterest and read blogs where people describe their thought process along with their pictures. My quilt books, books from the library, and the internet. And occasionally it just comes to me in the middle of the night! I get most of my quilting inspiration online, & in quilt magazines. I get inspired by postings on facebook and from quilting magazines and shows. I get most of my quilting inspiration following quilting blogs and getting email newsletters from fabric stores. I love to see what is available out there, and love the colors and pattern ideas. I have bookmarked more information on quilting than I can ever hope to use. I would love to win EQ7 and try out all these tutorials, I was always afraid to even consider EQ7, but you have made it much easier to understand, and desire! In my mind I often think about geometric forms an when I have an idea I scribble to a Book which I ever have with me. And than the Inspiration grow. I find inspiration everywhere: dishes, floor tiles, paintings, you name it! I get my inspiration(s) from a variety of places, usually Missouri Star Quilt Company, the internet, Block of the Day, etc. I am not an experienced enough quilter to come up with my own designs, although I am planning to dabble on a few original blocks in the near future. I get inspiration from my grandchildren, nature, architectural details, quilt books, and magazines. Additionally, Pinterest, blogs, and the Internet in general, have opened up a world chock full of ideas to quilters. I get my inspiration from Facebook quilting groups and youtube. I get inspiration from Pinterest, many different websites and blogs, quilt books and magazines, quilt shows and shops, and from nature. Inspiration is all around me! Inspiration is Everywhere. It only takes a different kind of looking. Sometimes I think I have “quilt” brain. I love EQ7. I have spent hours “playing” with all the options. Designing is so easy and rewarding to see the final product! My inspiration comes from pretty much everywhere… Pinterest, books, magazines, etc. I get most of my quilty inspirations from onine blogs. Online and from friends. Thanks for the chance to win. I have wanted to give EQ a try but haven’t yet. Quilting and sewing blogs are my main inspiration. There are so many creative women (and men) out there willing to share their photos and ideas. I just soak it up, take notes, pin to pinterest, and take it from there! I get inspired by fabric collections, online photos of quilts, in store samples, nature and playing with EQ7 to see what I can make with fabrics I have. It’s fun! Thanks for the hop. It’s been very informative. I get my inspirations from the internet, quilt books and magazines. I find my inspiration for quilts from almost anything. La mia ispirazione è data da tante cose: La natura, i paesaggi, suggerimenti dal web e da quello che sento in quel momento. Inspiration comes from quilt shows, books, magazines and others. I visit lots of blogs, scour Pinterest, and have lots of books and magazines for inspiration. Great give away opportunity, thanks. My inspiration comes mainly from reading quilty blogs. There is so much creativity going on online! I usually get my inspiration from being directed to new blogs from ones I already read. There is so much cool stuff out there that I’ll never begin to see it all, but what I have seen is very inspirational. Thanks for the chance to win!! I get my inspiration from just about anywhere! Blogs, quilt shops, Facebook, magazines, anywhere! I get my inspiration from lots of places. Sometimes it is something I see or hear that is totally un-quilt related and other times it can be a quilt that sparks and idea that is totally unrelated to the quilt I just saw. I get my inspiration from family and friends, fabric and patterns remind me of them. I get my inspiration searching on ‘pinterest’ and looking through any (all) quilt shops for lastest patterns. I get my inspiration from magazines and the internet mostly. Others while I lay in bed trying to go to sleep. I get my inspiration from other quilts, nature, photographs, art, and beautiful fabrics. Like lots of others, I get inspiration from many sources. Nature, architecture, blogs, magazines, books, fabric — the list goes on! I attend several quilt shows each year and there is always a lot of inspiration in each one. I also like browsing quilt magazines. An upcoming event has inspired me to make a quilt also. I get inspiration from architecture, nature and other quilters!! I get inspiration from nature, architecture, and randow patterns and objects. My inspiration comes from … everywhere (and often the most unexpected places). My quilting inspiration comes from everywhere, but mostly from my family. Almost every project I take on is something that reminds me of a family member, or something I seek out to make for them. Things I read, things I see, other people’s work — quilts and other things, nature, the clouds, emotions, teachers, challenges. Almost everywhere and anything can be an inspiration. I sometimes get my inspiration while sleeping. I wake up in the morning with a certain clarity! I get my inspirations from reading quilters’ blogs. I get my inspiration from my older sister (by 2 years lol). Her imagination, abilities and of course talent surpasses mine, but she is generous enough to help me create masterpieces that are beyond my imagination. I am inspired by books, magazines, sewing programs on tv, classes, and quilt shows. Everywhere! But probably mostly from looking at other quilts. Quilting magazines, quilt shows, blogs, friends’ flickr feeds; seeing what other people have done inspires me most. Blogs and pinterest mostly, but sometimes block designs just pop into my head. I get my inspiration from my fabric. My inspiration comes from many sources including books, blogs, nature, friends and everyday items! I get my inspiration from Quilting books, the web, my family. quilt shows, my wife’s quilts and old classic blocks with a new twist. I prefer deep and rich colors. Sometimes inspiration is from nature but sometimes it’s from all the great quilters on all these wonderful blogs. I’m mostly inspired by what see on blogs and websites these days. I do purchase lots of books and magazines but there’s a wealth of quilting passion on the internet. I get my inspiration from online sites, friends, books, magazines; everywhere! Calming things inspire me–beach/ocean my fave. I am brand new to quilting and I’m getting inspiration as well as education from all of wonderful online quilting communities. Seeing other quilts inspires me to go home and get working. Much of my inspiration comes from my family. I will see a fabric and think of them and how that particular fabric will make up in a quilt for that person. Inspiration is everywhere! Nature, animals and children are great inspirations. Inspiration is all around. Flowers, trees,water, rocks, fabric, quilt magazines, and shows. The problem is finding time to act on the inspiration. Blogs, websites, quilt store displays, experimenting in EQ7. I get my inspiration from quilting magazines. I get my inspiration from my Mom and quilting magazines, I would love to be able to use EQ7 and create my own quilts. I get my inspiration from viewing others’ quilts, through my guild and Pinterest site. I get my inspiration from great blogs, online quilters, magazines, and the internet. Thank you for all the effort put forth with this hop. I have enjoyed it immensely. I get my quilting inspiration from discussions with friends at our local quilting club, from magazines and books… Online websites are also quite interesting and give many ideas. I get my quilting inspiration from everything I see…nature, architecture, abstract designs…inspiration is everywhere! I get my inspiration from marble floors. The Vatican is fabulous! I get my inspiration from mostly internet sources such as blogs, tutorials, patterns, fabric designs, etc…. I mostly get my inspiration from reading quilt blogs and quilting magazines. Mostly nature, but also quilt magazines, blogs and pictures. I would really love to win this software and begin designing on my own. Thanks for the opportunity. I get my inspiration from books, blogs, Pinterest boards, other quilters! My inspiration comes from other bloggers, quilts and fabrics from the past, Eleanor Burns, nature, fine art, tile floors, almost everywhere! Blogs, and fabric just feels too good and looks to good to not buy so I’m always inspired to stitch:) Thank you! I would love to win EQ7. I am inspired every day from sun-up to sun-down. All you have to do is look around you to see all the marvelous things in the world. Then you can translate what you see into a quilt design! Individual blocks, colors, books, my mountain landscapes. My inspiration comes from nature, colors, weather, family, books and a very fertile active imagination! And of course, browsing blogs and fabric sites! I get my inspiration everywhere – looking at other people’s work, at art galleries, walking outside – and well, Pinterest!!! Inspiration is all around. From a road sign to a question from a toddler, I have ideas in my head begging to get out! I am a new quilter and so far I find that I am getting my inspiration from other Quilters. I use facebook, pinterest, Craftsy, quilt shows, my LQS and ladies in classes I have taken. I get inspiration from bqf’s (best quilting friends), nature, anywhere I look! I get so much inspiration o line from blogger friends. Sorry our contest is over. Thanks for your interest!